Age Related Macular Degeneration is the most common form of registered blindness in the western world. It is thought to affect one in ten people over 55. AMD can be irreversible and lead to a reduced quality of life due to difficulty in performed everyday tasks. AMD is an eye disease that causes the breakdown of the macula, which is located in the centre of the retina towards the back of the eye. The macula is responsible for central vision and allows you to see details. People living with AMD may notice a dark spot or black area in the centre of their vision. This caused difficulties in activities such as reading and driving, even just seeing other peoples faces. Dry AMD is the most common form of AMD and accounts for over 85% of cases. AMD often starts in one eye and can spread to the other eye over time. The most common symptom of early AMD is blurring of vision. Significant loss may occur in 3 to 6 months. No medical or surgical treatment is available for this condition; however, vitamin supplements with high doses lutein Omega III or Macushield supplement tablets have been shown to slow the progression of dry macular degeneration and in some patients improve visual acuity. Look directly at the centre dot with the uncovered eye and keep your eye focused on it. While looking directly at the centre dot, note whether all lines of the grid are straight or if any areas are distorted, blurry or dark. 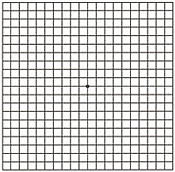 If any area of the grid looks wavy, blurred or dark or if you detect any changes when looking at the grid, you should notify Mr Golchin immediately. About 10% of people who have macular degeneration have the wet form, but it can cause more damage to your central or detail vision than the dry form. The earlier that wet macular degeneration is diagnosed and treated, the better chance you have of preserving some or much of your central vision. Treating the wet form of macular degeneration may involve the use of anti-VEGF treatment, thermal laser treatment. Treatment of wet macular degeneration generally reduces but does not eliminate the risk of severe vision loss. A common way to treat wet macular degeneration targets a specific chemical in your body that causes abnormal blood vessels to grow under the retina. That chemical is called vascular endothelial growth factor or VEGF. Several new drug treatments (called anti-VEGF drugs) have been developed for wet AMD that can block the trouble causing VEGF. Blocking VEGF reduces the growth of abnormal blood vessels, slows their leakage, helps to slow vision loss, and in some cases improves vision. 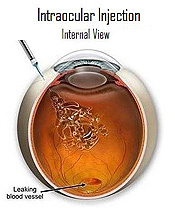 Mr. Golchin administers the anti-VEGF drug (such as Lucentis or Eylea) directly to your eye and this is performed as an outpatient procedure.